It had been many years since our last trip to Disney World in summer (almost 15!). We have been fortunate to visit during fall breaks in October, sneak away for a few days in the beginning of December or a weekend here or there over the last 5 years. 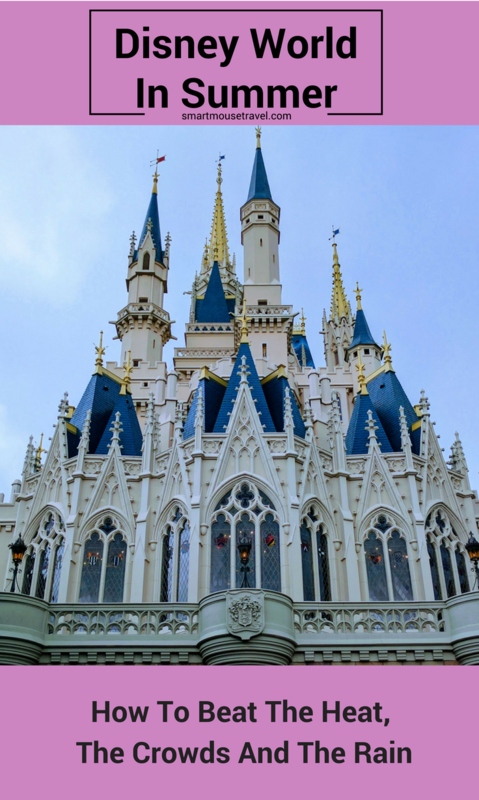 Even with all of my experience traveling to theme parks, I had forgotten some very important things about visiting Disney World in summer. Here is what you need to know when heading to Orlando theme parks over the summer. I know this seems obvious, but the parks felt considerably busier even though we visited at the very beginning of June. Be prepared for lots of people, slow walking and long lines for attractions. For example: we usually wait about 5 minutes for Journey Into Imagination with Figment in Epcot (simple ride that is fun, but nothing fancy). During our summer trip the line was 45 minutes long. Make dining reservations ahead of time – We routinely saw people turned away from restaurants because they did not have Advanced Dining Reservations (see my complete guide for more information). Make FastPass+ reservations – Again, having at least 3 rides per day where we didn’t have a long wait helped us to experience more. Make sure you review my guide on everything FastPass+. Have something to pass the time in lines – Last minute I had bought a $1 Disney joke book from 5 Below. I kept this joke book in my backpack, and Elizabeth amused herself (and other kids) with the jokes in longer lines. Other options are bubbles, stickers, or a family favorite “The Last Letter Game”. This game is where you say a word and then the next person says a word that starts with the last letter of the previous word. We somehow amused ourselves with that for 40 minutes straight when waiting for Na’vi River Journey. Manage your expectations – I must admit I struggled with this. We are usually go, go, go on our Disney World trips and experience attraction after attraction. This trip we did about half to three quarters of what we would have normally done. Instead of our usual routine we experienced different things like walking around our resort, listening to live music at Portofino Bay, playing Agent P’s World Showcase Adventure, and really immersing ourselves in Pandora’s lovely landscape. We still had a lot of fun even though it was quite a different trip for us. Now to be fair, our trip had unseasonable rain due to a tropical depression in the Gulf of Mexico. We had inches of rain per day on a couple of occasions. However, from June to September the average rainfall in Orlando is 6 to 9 inches (15 to 23 cm) of rain per month. Based on these numbers it is likely there will be a stray afternoon thunderstorm during your summer Orlando trip. Make sure you pack ponchos or raincoats – I have always packed ponchos or raincoats in my park bag for our trips to Disney World. Before this trip I had used them exactly twice in all of my previous days combined. This time it rained every single day. The raincoats and $4 poncho I brought were the best investment I made for our June trip. If you have a park bag make sure your poncho will cover it and you to make sure your belongings stay dry. Pack a waterproof stroller cover and clips – There is nothing worse than a soaked stroller for your little one. I always packed a cheap shower curtain and clips to cover the stroller and keep it dry while we were on rides or at meals. Pack spare shoes – As our trip was getting nearer the weather was looking rainier and rainier. Because of this forecast I made sure to pack two pairs of shoes for each of us. That way when the rains came and soaked the first pair we had a second dry pair to hopefully last until the first set dried out. Another option is to bring fast-dry shoes like Crocs or flip flops if you can tolerate walking long distances in them. We averaged 6.7 miles (11 km) per day of walking, and we had several short days because of the rain. Pack spare socks and clothes – I always pack some extra clothes for our trips just in case. This worked out perfectly since sometimes we were so wet we needed a new outfit for dinner. And dry socks feel heavenly after squishing home in the rain. Summer in central Florida is no joke. I thought I was mentally prepared for the heat. Chicago can get above 90°F (32°C) with high humidity – how different can it be?! Very different is what I found out. I think the high temperatures and humidity coupled with the large crowds made it feel oppressive at times. Hydrate – Make sure you drink more than you think you need. You would be surprised how quickly you can get dehydrated. We had a freezer in our room (some Disney on-site hotels have full or mini-fridge options) so we froze drinks I had ordered from Garden Grocer overnight and brought them to the park with us. It was awesome to have a super-cold drink at the ready. You can also bring a thermos into the park to keep drinks cold. Another option is any place with fountain drinks on Disney property will provide ice water at no charge. Wear sunscreen – It seems obvious to wear sunscreen on bright sunny days, but remember to apply even if it is overcast. A surprising amount of rays can make it through the clouds and cause a sunburn. And sunburns are no fun. Enjoy the resort pool – In all of the trips we have taken as a family I have packed Elizabeth’s swimsuit twice. We prefer to see the sights of the place we are visiting more than spend time at the hotel pool. This summer trip to Orlando I was very sorry I had not packed our swim suits. A day at the pool would have been a nice reprieve from the crowds and the heat. Here are some more great tips from Have Diapers Will Travel on how to stay cool at Disney World in summer. I know that for many people summer break is the only opportunity to make the trip to Disney World. That’s okay! 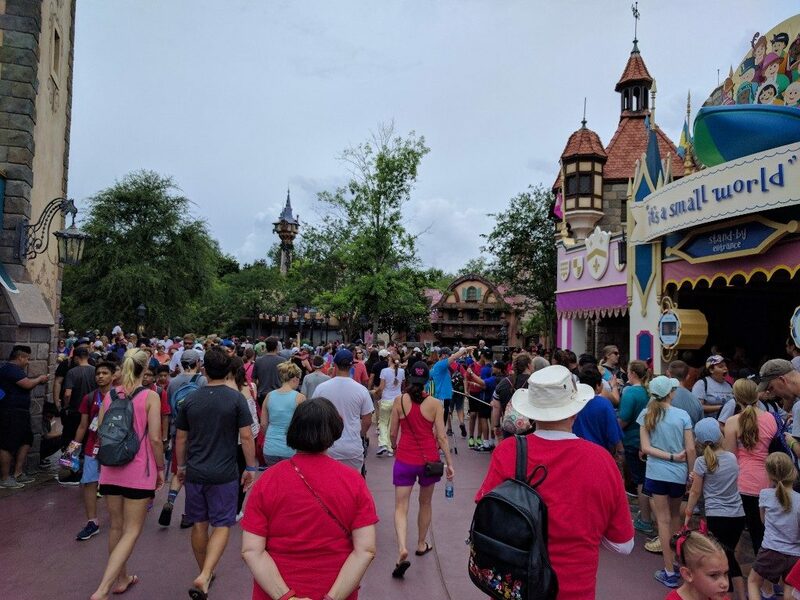 Although our trip was plagued with rain, heat and higher crowds than I expected we still had a memorable time at Disney World (and Universal Orlando). Being prepared for the heat, rain and crowds helped us to make the most of our trip. And having a positive attitude certainly was essential, too. Make sure you pack some patience and flexibility in addition to ponchos and sunscreen to make it a great trip! How do you prepare for summer at Orlando theme parks? Share your tips in the comment section! I love these tips! We are going at the end of August this year and I want to be prepared! We go in mid-May and the weather is HOT then. The key for us is hydration and taking breaks. If that means a ride on It’s a Small World (or any indoor ride) or actually sitting down somewhere in the shade for a few minutes. I travel with our whole family, which includes 6 kids, breaks are a MUST. We did Walt Disney World in the summer for the first time this last year, and these tips are spot on! The heat is real, and we spent a lot of fun time at the pool just like you suggested! I’m glad you agree! Disney World in summer is a different kind of trip than other times of year, but can still be a lot of fun if you prepare for the weather.